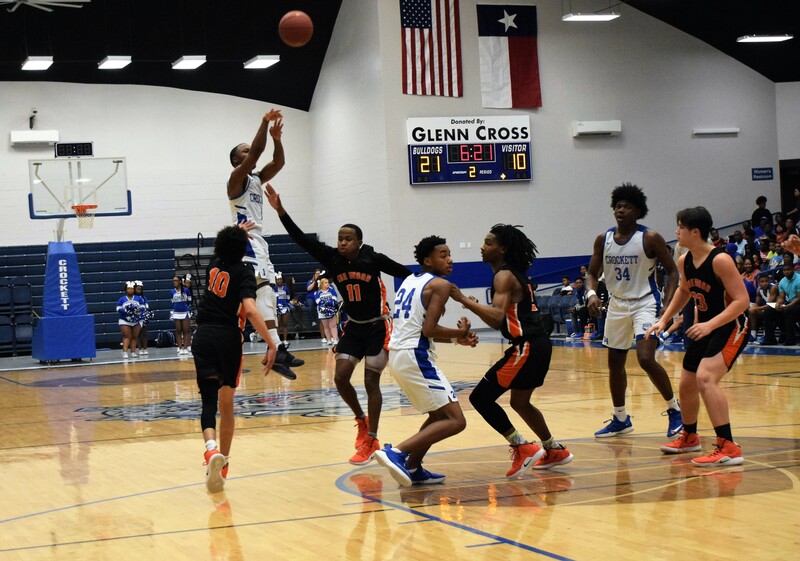 CROCKETT – With only a handful of games remaining in district competition, the Crockett Bulldogs welcomed the Westwood Panthers to the Andrew J. Hopkins Activity Center for a District 20-3A contest. The stakes were fairly high coming into the game. A win by Crockett would keep them in a first-place tie with the Teague Lions with a Feb. 12 showdown looming. Westwood, on the other hand was fighting for their playoff lives as they sat a game behind the Elkhart Elks for the fourth and final postseason berth. The Bulldogs made sure the Panthers would need help to make the playoffs after they blew out Westwood by a final score of 81-37. As the game got underway, Crockett raced out to an 18-6 lead thanks in large part to Jordan Bedford’s 10 first quarter points. Teammate Allen Horace powered in four while AJ Owens and Ty White both had two. The Crockett defense held the Westwood offense to just six first quarter points on a pair of free throws from both Mario Black and Jaren Turner. Ka’Donte Watkins added the other two for the Panthers. The Bulldogs kept up their torrid offensive pace in the second quarter as White came alive with eight points. Horace added six more, Bedford hit a three and AJ Owens made two of three from the line as Crockett opened up a 37-18 lead by the time the horn sounded for halftime. Despite a hand in his face, Crockett’s Allen Horace gets ready to slam the door on the Westwood Panthers’ hopes of winning as the Bulldogs thumped the Panthers by a final score of 81-37. Black scored all 12 of the Panthers’ second period points on three, three-pointers, a two and one of two from the charity stripe. After the break, the Bulldogs took the wind out the Panthers sails with two monster dunks from Horace as part of his five points in the third quarter. White also had five while Emmanuel Aldaco added three. Four other Bulldogs – Bedford, Jalyne Carruthers, Teddy Jones and Demetrius Williams – all had two. The Panthers’ offense came from Black once again with eight points. Bri’Darian Hunt and Riley Thieme had two apiece as Westwood found itself trailing by a score of 58-30 after three periods were in the books. Crockett closed the game out with a strong fourth quarter as they rattled off 23 points while holding the Panthers to seven on four points from Aeneas Page and a three from Jasen Hollingsworth. Owens paced the Bulldogs in the fourth with eight points. Chris Purvis dropped in five and White added four. Dennis Simmons knocked down a three, Aldaco had two and Keeshun Easterling made one of two from the line to help give Crockett the 81-37 win. On the game, Westwood was led by Mario Black with a game-high 22 points. Aeneas Page had four and Jaen Hollingsworth had three. Four other Panthers – Bri’Darian Hunt, Riley Thieme, Jaren Turner and Ka’Donte Watkins – all had two. Crockett was led in scoring by four players in double figures. Ty White paced the Bulldogs with 19 points. Jordan Bedford and Allen Horace had 15 apiece while Aj Owens had 12. Emmanuel Aldaco and Chris Purvis both had five while Dennis Simmons knocked down a three. 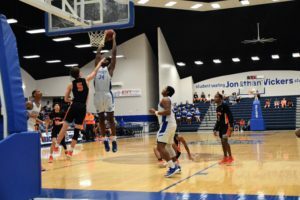 Jalyne Carruthers, Teddy Jones and Demetrius Williams all had two and Keeshun Easterling rounded out the Bulldogs’ point production by converting one of two from the line. The win keeps Crockett in first place in District 20-3A with a 9-1 record, just ahead of Teague who sits at 8-1. Westwood slipped to 3-6 and needs a strong finish if they hope to have a shot at the postseason.